Son of man is a title Jesus used for himself. Sunlight is streaming in through the large window behind the figures. From left to right: Zacchaeus’ wife, Zacchaeus, Mary Magdalene, Jesus the Christ, James (son of Zebedee), a servant kneeling on the floor. 01) (This page) Luke 19 – Zacchaeus the tax collector – Scene 07 – Salvation has come (Version 01). This scene has sunlight streaming in through a large window behind the figures. 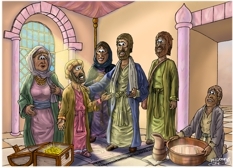 02) (Next page) Luke 19 – Zacchaeus the tax collector – Scene 02 – Too short (Version 02). The sun’s rays from the window are absent, as are the strong shadows on the figures. In all other details it is identical in content. I love Jesus’ statement in verse 10 “For the Son of Man came to seek and save those who are lost.” Zacchaeus was lost: he did not have salvation, but his encounter with Jesus brought him faith to believe. He made the gigantic leap from the kingdom of darkness to the kingdom of light. I wanted sunlight to play a major part in this scene, and decide to include a large glass window in Zacchaeus’ house. Hebrew architecture rarely (if ever) included much more than a thin slit window, set high up in a wall, which is the way I usually depict windows in my drawings of Hebrew architecture. However, we know that Zacchaeus was a wealthy man, so I reasoned that he could probably afford a glass paned window in his opulent house. You can also see marble columns and tiles, along with the chest of gold, all evidence of Zacchaeus’ wealth. I enjoyed depicting sunlight streaming in through the window, with little dust motes picked out in the rays. The sun’s rays are also a metaphor for the illumination of Zacchaeus’ mind and the salvation that has come to him from God in heaven, through Jesus the Christ. The servant kneeling on the floor is a young man who has performed the foot washing duty of a good Hebrew host. This task (traditionally offered to guests in one’s home) was considered the lowest of all house hold duties. 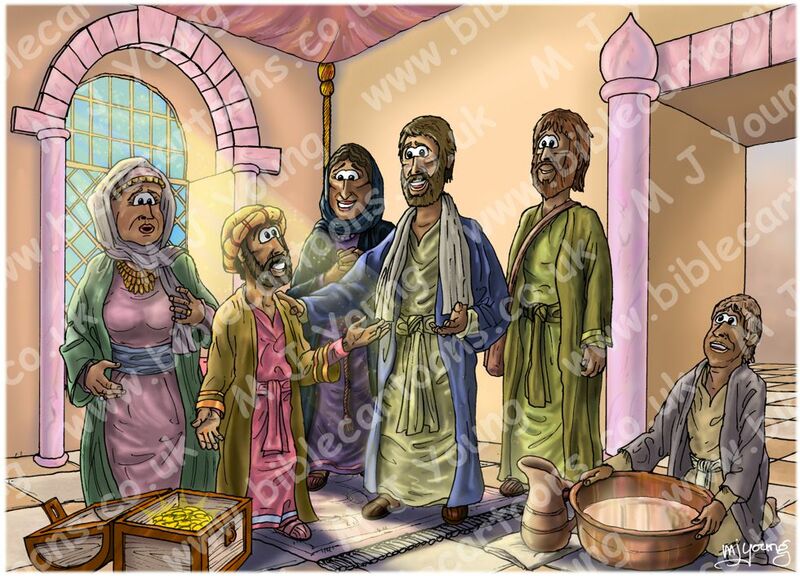 The young man has a pitcher of water and a bronze bowl in front of him, in which the three guests would have just had the dust of Jericho’s streets washed off their feet. Notice the young servant doesn’t have any footwear on himself.